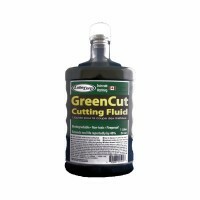 GreenCut® Plasma Cutting / Misting Fluid is a CNC plasma cutting water table treatment preventing corrosion and bacteria. Also a high performance, safe, biodegradable coolant used in machining, cutting, grinding, drilling and tapping of all metals. Easy on the hands and helps heal lacerations and dermatitis. Vapors wont cause asthma or breathing problems. Spills are safe to walk on "no-slip"
The recommendation is that users check the pH level of the plasma table fluid every two weeks to ensure it’s between 9 and 10 pH. If it’s less, add more fluid. If the right amount of GreenCut® fluid is in the table, the liquid should appear green. Also, because water evaporates, and the fluid does not, additional water will need to be added to maintain that 20-to-1 ratio. This biodegrading effect remains constant as long as the fluid-to-water ratio remains at appropriate levels. The recommendation is a 20-to-1 ratio—20 parts water to 1 part GreenCut®. If the ratio gets to 50-to-1, the fluid loses its effectiveness. For the fluid to be effective, it needs to come in contact with the sheet or plate being cut, so we recommend submerging the work in water. Specifically, material less than 0.25 in. thick should be submerged totally to avoid air being trapped underneath, which can form an explosive steam mixture with ambient air. 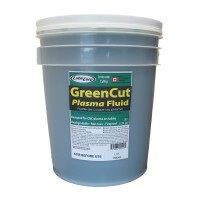 Whilst not specific to the GreenCut® fluid is just a precaution to take when plasma cutting in a water table. Plate more than 0.25 in. thick can be partially submerged. Please note: GreenCut Cutting Fluid delivery is subject to a £12.00 plus VAT charge per unit for delivery of chemical products.